Emissions are a pressing issue for every industry. Even more so in transport and logistics sectors, such as shipping. Goals set by the UN are designed to reduce ocean-carrier emissions by 50% by 2050, compared to 2008 levels. While different countries have set different individual targets for reducing their own environmental impact levels, there is a general consensus that all locations across the board need to play a role in helping to reduce the overall eco effect of the shipping industry. As a result, there are a number of key initiatives now in place that are likely to make a real difference. The IMO has adopted a new strategy for reduction in CO2 emissions in the shipping industry. This new strategy is in line with the expectations of the Paris climate agreement and is designed to set a global standard for shipping emissions. The strategy is part of a three step process created by the IMO, which began by requiring ships to collect data on their fuel oil consumption as of March this year. It is hoped that this data will provide insights into ways to enhance energy efficiency and to address GHG emissions. The new MARPOL Regulation 22A targets ships of 5,000 gross tons and above, which are responsible for 85% of shipping CO2 emissions. Data on these ships will be reported to flag states each year to monitor their use and impact. The IMO’s new restrictions on sulfur oxide come into force in January 2020 – they will reduce acceptable sulfur oxide levels from 3.50 percent m/m (mass of sulfur/total mass) today to 0.50 percent m/m in 2020. The fuel consumed in the shipping industry is the primary cause of negative environmental impact and cleaner fuels could make a real difference. 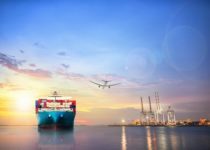 A recent report from the European Maritime Safety Agency indicated that methanol and ethanol would be good alternative fuels for reducing CO2 emissions and both are currently being investigated as options. In 2015, the world’s first methanol conversion of a vessel’s main engines took place – successfully – on the ferry Stena Germanica. There are challenges to using alcohol as fuel, such as a lower energy density than fossil fuels. But both methanol and ethanol are clean burning, can be produced renewably and have no sulfur content. Hull coatings can improve speed and fuel consumption. For example, the COSCO Europe vessel reduced fuel costs by $4.5 million and CO2 emissions by 29,500 tons in four years by switching to a more innovative hull coating that reduced growth of organisms on the vessel’s hull. Many vessels around the world have been participating in slowdown programmes to help reduce emissions. For example, in California 10 shipping companies signed up in the Santa Barbara Channel region to reduce shipping speeds to 12 knots or less. Much is being done in the shipping industry to help reduce emissions in one of the world’s most polluting industries. The impact of those efforts is already being positively felt. Here at UCS, we pride ourselves in minimizing the environmental impact of our shipping process. Get in touch with us to find out more today.